Walter E. Nelson Co. Main Office – Walter E. Nelson Co. The “Flagship” and original location of Walter E Nelson Co. is located on Swan Island in Portland, OR. 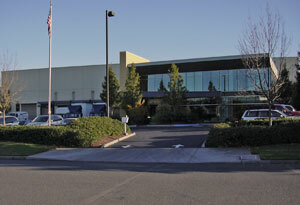 In addition to housing the Wenco Management and Administrative staffs, this state-of- the-art distribution center uses the latest technologies to efficiently pick and deliver your product to the Portland metro area the very next day. This warehouse facility was doubled in 2010 by the acquisition of a 47,000 square foot building directly behind the “old” warehouse enabling us to carry a wider array of products for our Jan/San, laundry, and packaging customers. The Portland Wenco currently employs over 150 employees including a sales force of 30. We staff a service department with a full time commercial technicians certified in Nobles, Tennant, ProTeam, Karcher/Windsor. We also offer mobile van service at your facility for servicing larger pieces of equipment or planned maintenance programs.